Without getting into the actual statutory language enacted by our legislature, there are essentially two types of filings for divorce, one is for a no-fault divorce, and the other is a divorce based on fault (i.e., adultery, abandonment, incarceration, severe substance abuse and addiction to name a few). The majority of divorces in New Jersey are no-fault divorces based on “Irreconcilable Differences”. These are differences between the spouses which have caused the marriage to break down irretrievably with no prospect of reconciliation. The advantage of this approach is that the “dirty laundry” between the parties is excluded. A common misconception of filing for divorce based on fault grounds, is that a Court will award the non-faulting party more in terms of assets and/or alimony. However, in most circumstances, this is not the case. Further, filing based on fault grounds is typically more expensive, as the spouse claiming the fault has the burden of proof and must show sufficient evidence to prove his or her case for which the other side will surely defend. Can a Divorce be Uncontested in New Jersey? A question that many prospective clients ask, is whether or not the matter can proceed in an uncontested fashion in order to expedite matters and save money. Not only can a divorce proceed in an uncontested fashion, it is the preferred route. A matter is “uncontested” if the parties have arrived at an agreement with regard to all issues arising out of their marriage. This would include, but not be limited to, alimony and child support, property distribution (including businesses), the allocation of debt, life and health insurance issues, and those dealing with taxes and college for the children. Oftentimes, a spouse seeking a divorce will arrive at my office explaining that the parties have come to an agreement on most if not all of their issues. If this is in reality true, the divorce can be expedited as the Courts will schedule settled matters ahead of contested matters. One should not get confused between an uncontested divorce and a no-fault divorce. The no-fault divorce, as set forth in the other topics on the website of The Law Offices of Philip C. Puglisi, LLC, essentially means that a spouse is not claiming any specific fault against the other spouse as causing the demise of the marriage. 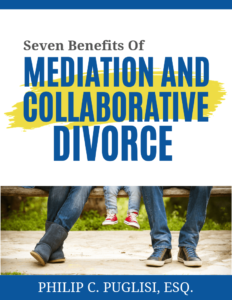 In an uncontested divorce, the issues have been resolved by the parties through Mediation, the Collaborative Process or as a result of a litigated case being resolved before trial. What Happens if You Just Want to Separate From Your Spouse in New Jersey? An issue that frequently arises regarding couples that no longer get along or want to live together, is whether they can separate without getting divorced. The short answer is, New Jersey does not offer a “legal separation” as many other States might allow. However, this does not mean you are prohibited from physically separating. In fact it is fairly common for spouses to do so. Some do it as part of a “cooling off” period, so that they can reflect on whether or not they actually want to end the marriage. Others separate because the living arrangements become unbearable. In either case, the parties are free to separate for any length of time they might choose. But the Court will not sign any Order, Judgment, or Decree declaring the parties separated. What the parties should do if they intend to separate for any length of time is to live pursuant to an agreement detailing their rights and responsibilities including their financial obligations as well as custody and parenting time. Thus, even if the parties desire only to separate, it is important they consult with a lawyer to receive the appropriate advice regarding their respective rights and obligations. A question that most prospective clients ask, and rightfully so, is how long it might take to get divorced in New Jersey. The answer is it depends. The more complex the issues are, the longer it will take. If the matter is uncontested, that is most, if not all of the issues are either resolved, or can quickly be resolved, the parties can conceivably be divorced in a matter of months. However, if issues remain contested, the divorce can take as long as it takes to resolve those issues. That having been said, some counties, including Bergen County require that the case be completed, either via settlement or through trial, within one (1) year from the date of the filing of the divorce complaint. In any county, once the divorce complaint is filed, the Court controls the scheduling. After the divorce complaint is filed with the Court and then served upon the other party (Defendant), he or she has 35 days from the date he or she has been served to Answer the complaint or file an Appearance with the Court. The filing fee for the divorce complaint is approximately $300.00, and for the Answer and/or Answer and Counterclaim approximately $200.00. After the Defendant files his/her responsive pleading, the Court will hold what’s called a “Case Management Conference” (CMC), which is where and when the Court will first hear if any major issues exist, so that it can properly schedule the matter going forward. For example, the Court will want to know if custody is an issue, if there are any businesses or assets that need to be valued, or if any issues exist regarding alimony and child support, etc. Most of the time, the divorce will be completed within the one (1) year time frame from the date of the filing of the complaint. However, it can be sooner if the parties resolve all of their issues. Judges are very happy when they hear that the parties have come to a resolution, so as to free up the Court’s time in not having to proceed with a trial. Once a Divorce Complaint is filed in New Jersey, and the Defendant has responded to it, the Court will schedule the first hearing which is known as a “Case Management Conference (CMC)”. At this hearing, the Court will inquire as to what major issues exist between the parties, so it can properly schedule its calendar. Such inquiry would include whether or not custody or alimony and child support is an issue, whether or not any assets or businesses need to be valued, and if any experts need to be retained. At the CMC, the Court will issue an Order setting forth dates that the parties must adhere to regarding production of documents, obtaining expert’s reports and the like. This is also known as the discovery phase, the time in which the parties exchange financial information, obtain appraisals and bank account, retirement and credit card information, etc. The Court will usually schedule a second CMC to see where the parties are at at that time and perhaps set additional deadlines. What is the Purpose of the Early Settlement Panel (ESP)? After that CMC, the Court will usually schedule what’s called an “Early Settlement Panel” (ESP) which is a panel of three lawyers who volunteer their time to make recommendations about your case. The lawyers for the parties would submit position statements as to what he or she feels his or her client is entitled to, and the reasons therefore. After reading the position statements and speaking with counsel and the parties, the panel will make a recommendation as to how they think the matter should be resolved. However, the recommendations are non-binding and the parties are free to reject them. If either party rejects the recommendations, the Court will then order the parties to attend mediation and set the matter down for trial. New Jersey has a requirement that divorcing couples attend a mandatory Parenting Education course. It is a one-time, multi-hour course. Once the divorce complaint and the answer to it are filed, the Program will send a notice to each parent as to the date and time to attend. The main purpose of the program is to educate the parents on how difficult and damaging it can be to the children if they insist on fighting. Sometimes a matter cannot be resolved amicably, and various experts may be retained to aid the Court, as well as counsel, in resolving a particular issue. For example, if custody is an issue, each party is free to retain their own custody expert to determine where the children should live based on what is in their best interest. Alternatively, the parties can choose one expert (joint expert) to perform the evaluation. Experts are also used to value businesses and licensed appraisers are used to value real estate. Frequently, forensic accountants are hired to not only value a business, but to provide income verification and analysis so that the appropriate spousal and/or child support amount can be arrived at. It is important to note, these experts can be costly, and their fees are in addition to any of the lawyers’ fees.